The Adventures of Patty-Cat & Kittle, a story by Barbara Cefalu, edited and story board by Skyler Dennon and beautifully Illustrated by Emmanuel Saltis, has thirteen chapters in which the kittens have a series of adventures with ants, mockingbirds, spiders, frogs, squirrels, dogs, and of course, other cats and kittens. In addition, their cousin Fred, a known catnip user, comes to visit them and totally disrupts the household. In all of these experiences the kittens discover the greater world and how to bring joy, peace, and love to those they meet. Patty-Cat and Kittle come to live with Angel at one-hundred-twelve Liver Lane one rainy day. Angel has a lively party for the neighborhood cats to meet the baby kittens and all agree they are fine kittens. The kittens are utterly delighted with their new world. Kittle is the explorer and she meets with birds, animals, and bugs. Patty-Cat is the homemaker, happily cooking, cleaning, and staying at home. Friends of Patty-Cat & Kittle, is a compilation of songs about and by many of the characters in the story, brought to life through music. This delightful journey into the minds of Patty-Cat, Kittle and all of their friends is brought to you with joy from their creator Barbara A. Cefalu and her creative team lead by Skyler Dennon. The CD features San Diego jazz favorites Janet Hammer & Fran Hartshorn, opera favorite Leah Bentley, and the enchanting character voicings of San Diego theatre favorites Nicole Tarentino-Mullet and multiple award winning Skyler Dennon, with special character artwork by Michael Soto. Enjoy their adventures as if they are your own! You’ll be singing along before you know it. 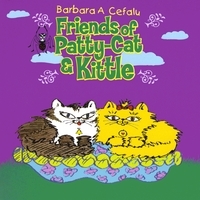 “Friends of Patty-Cat & Kittle”, is a delightful complilation of songs about and by the characters who appear in the children’s story “The Adventures of Patty-Cat & Kittle”, brought to life through music by Barbara A. Cefalu and Skyler Dennon.